The Graco G1 Plus pump from MotionSource provides you with a high ROI on grease and oil applications. A budget friendly pump with a little more gusto than the G1 Standard, the G1 Plus pump has a built-in on/off timer with optional low-level feature that shuts down the pump when empty. Manual run initiates lube cycles on-demand with the option for remote control. 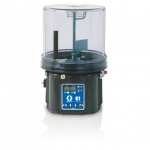 The Graco G1 Plus Pump offer a choice of 2, 4, or 8-liter reservoirs for oil or grease to match your system needs. A versatile pump with an available with stirring paddle and wiper arm to keep material from separating. There’s also an optional follower plate ensures grease stays level for extreme angle installations. Designed for long working life, the unique offset drive design minimizes load and stress on the motor and pump element. At MotionSource we’re the experts on the Graco G1 Plus pump, we’ve installed thousands and offer extended warranties on these workhorses to our customers. Call MotionSource today for a free quote or more information. 888-963-6686, email us at Sales@MotionSource1.com or use our handy “Quick Quote Form” and click send! Need help with service or installation of your Graco pump? MotionSource has a 24/7 full-service team ready to help with what you need, when you need it. Our service technicians are Graco trained and certified to help with your pump needs. We also specialize in programming your Graco G1 Plus pump! If you just need technical help, give us a call 888-963-6686. All of our customer support team is Graco trained as well. MotionSource is your Source for Graco G1 Plus pumps!